Merry sushi! Perfect for Christmas… or any time of the year when you want to impress your friends and family while spreading a bit of sushi cheer. The roll has an intricate design, yet it is still easy to make. Start by cooking a batch of white and a batch of pink sushi rice. Click here to learn how to make pink sushi rice. Now remove the orange skin of the crab sticks by finding the seal and peeling it back around the stick. Slice it off with a sharp knife. Take a half sheet of nori. Place the three crab sticks next to each other on the nori and wrap it into a small package. Cut off any excess nori. Let the package rest for 4 to 5 minutes with the seal side down. This allows the nori to absorb liquid from the crab sticks, in order to keep the seal in place. Place the tuna under the crab sticks package to begin making Santa’s hat. The tuna should be the same length as the crab package, but slightly wider. With the crab package laying on the tuna, slice lengthways and down about ½ cm into the tuna at the side of the crab package. Then slice off a piece of the tuna (also at ½ cm depth) to create a place for your crab package to fit in snugly. Watch the video to see how exactly this is done. Flip the tuna over and use your knife to gently cut a rounded top for the hat. Peel the tuna back gently as you slice to ensure a smooth edge. Flip it over again, and make an incision approximately ½ cm deep at the edge of your cut out for the crab package. Place a small piece of folded nori into the incision to make the black line of Santa’s hat. Now place the tuna piece on top of the crab sticks package, with the rounded edge on top. Take one softly boiled carrot. Cut off each end to make a piece that is the same length as a half sheet of Nori. Then cut the carrot into a square by slicing off the rounded edges of the carrot. Now slice off the squared edges to get a circular piece of carrot. Scrape your knife across any edges to ensure you have a good circular shape. Wrap the carrot in a piece of nori. 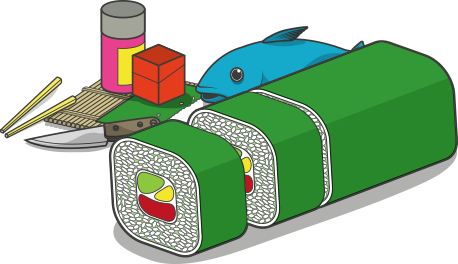 Place the nori wrapped carrot next to the crab sticks package underneath the tuna. This is the top piece of Santa. Let it cool in the fridge while you prepare the rest of the roll. Cut and wrap the second carrot in the same way and set aside. Take half a sheet of nori and cut it into 3 pieces. Put a little bit of cooked white sushi rice on each piece and roll into three small rice rolls. Do the same with another half sheet of nori. You will need 5 small rice rolls in total. Now make an extra-long nori sheet by gluing two half sheets together, using a little bit of sushi rice to make a seal. Cut the small rolls lenghtwise in half. Place 4 of these cut rice rolls with the rice facing upwards on the long nori sheet, approximately 1 cm from the edge of the sheet. Now add a thin layer of sushi rice on top of the rolls in the middle. Next place another ½ rice roll in the middle on top of the sushi rice. This creates a smiley Santa face. Add a little bit of rice to the sides of the smile to keep it in place. Now add some more rice on top of the roll that makes the smile. On top of that, place two ½ rice rolls (facing downwards this time) to create a v-shape on top of the rice. Place the second nori wrapped carrot in that v-shape. This is Santa’s nose. Place 2 more rolls on the side flanks (facing downwards) to complete Santa’s beard. Carefully watch the video to see how to do all this. Take 2 small pieces of nori and moisten one side with water. Roll each sheet into a very tight roll and set aside. These are Santa’s eyes. Wet your hands slightly and put a thin layer of the pink sushi rice on top of the assembled face, above the nose. Place the eyes on top of the pink sushi rice on either side of the nose. Now add another thin layer of pink sushi rice on top of the eyes. Note: the less rice you use in this step, the better, or you’ll end up with a huge Santa roll! Add a little bit of white sushi rice on the sides of the pink, to make sure it’s a round shape. Now take the assembled hat out of the fridge and place it on top of Santa’s face. Roll the long end of the nori loosely around the contraption you just made. Seal the nori with a thin layer of rice; this will act as glue. Let the roll rest for a few minutes, it will tighten up a bit which makes it easier to cut. Slighty wet the blade of your knife. Be sure to use a very sharp knife! Your knife should cut through the roll as if it’s cutting through butter, because Santa’s face is very delicate. Cut off one end to create a smooth surface. There you have it: Santa’s sushi face!